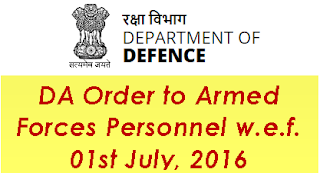 Subject: Recommendations of the Seventh Central Pay Commission —Decision of Government relating to grant of Dearness Allowance to Central Government employees - Rates effective from 1st July, 2016. 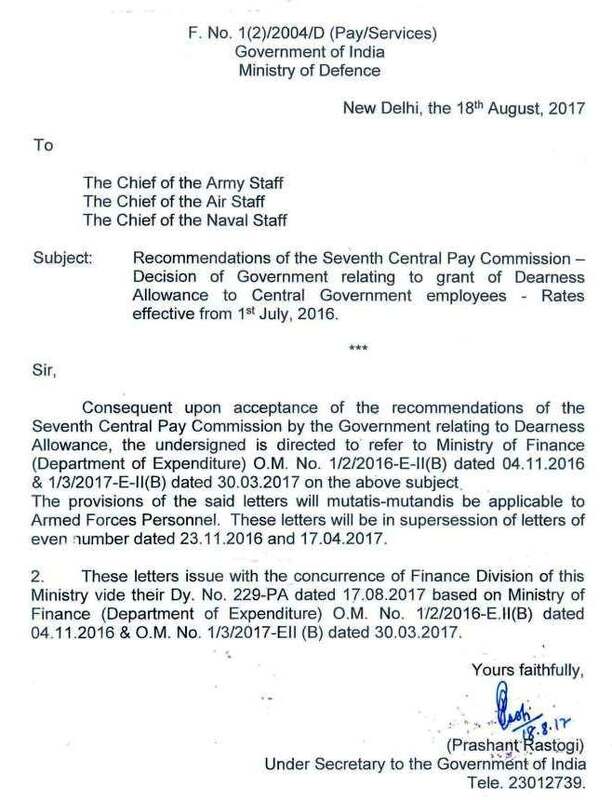 Consequent upon acceptance of the recommendations of the Seventh Central Pay Commission by the Government relating to Dearness Allowance, the undersigned is directed to refer to Ministry of Finance (Department of Expenditure) O.M. No. 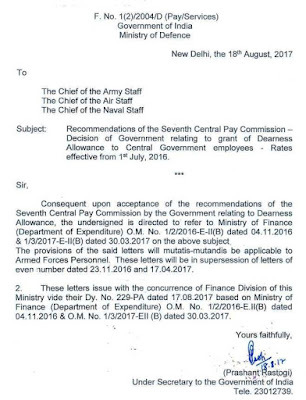 1/2/2016-E-II(B) dated 04.11.2016 & 1/3/2017-E-II (B) dated 30.03.2017 on the above subject The provisions of the said letters will mutatis-mutandis be applicable to Armed Forces Personnel. These letters will be in supersession of letters of ever lumber dated 23.11.2016 and 17.04.2017. 2. These letters issue with the concurrence of Finance Division of this Ministry vide their Dy. No. 229-PA dated 17.08.2017 based on Ministry of Finance (Department of Expenditure) O.M. No. 1/2/2016-E.II (B) dated 04.11.2016 & O.M. No. 1/3/2017-EII (B) dated 30.03.2017.